Provide comfort for the family of John Bis with a meaningful gesture of sympathy. 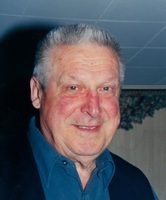 Passed away peacefully at Matthews House Hospice, Alliston April 9, 2019 in his 92nd year. Predeceased by his loving wife Helen. Loved father of Paul. Predeceased by his siblings Helen (John), Fred (Clarice), Steve (survived by Mary), Bill, Stanley and Mary (Chester). John will be sadly missed by his nieces, nephews, friends and his close friend and caregiver Connie Taylor. Visitation will be held at the Drury Funeral Centre 519 Victoria St. E., Alliston on Saturday, April 13 from 9:30-11:30 a.m. Funeral Mass will be held at the Holy Spirit Parish 650 Essa Rd, Barrie on Saturday, April 13 at 1 p.m. Interment to follow at St. Mary's Catholic Cemetery 208 Sunnidale Road, Barrie. In lieu of flowers memorial donations to Matthews House Hospice, Alliston would be sincerely appreciated. Donations are being accepted for: MATTHEWS HOUSE HOSPICE (Matthews House Hospice).